All is well inside the KickPort camp as the bass drum enhancer has secured a raft of high-profile signings and a sparkling new-look website. Ray Luzier (Korn), Thomas Lang, Brendan Buckley (Shakira) and Derek Roddy (Serpents Rise) are among those now using the item, and you can read all about KickPort on the overhauled www.kickPort.com. The Joey Jordison juggernaut keeps on rolling as it was this week announced that Slipknot will release a DVD of their jaw-dropping 2009 Download performance next month. (sic)nesses captures Joey and co's awesome headlining show at the Donington rock fest and will be released on 27 September. The news comes shortly after Joey triumphed in Rhythm's Greatest Drummer Of The Last 25 Years poll. Fancy getting a foot in the drum world's door? Tycoon Percussion is appealing for intern applicants for the coming year. The firm's summer intern gives a pretty solid argument for why you should get your CV in the post. He said: "The intern position was an excellent opportunity for me to gain experience and exposure to the music business. It's great to be able to see how things happen in the real world and work with people who are passionate about the same things as I am." 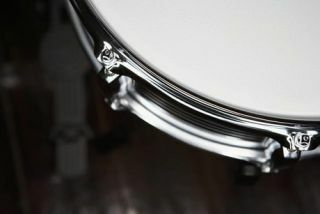 For more information visit www.TycoonPercussion.com.